Once upon a time at the 1948 Democratic National Convention, a young Midwestern mayor catapulted himself into history with his passionate speech urging the party to adopt a strong civil rights platform. He drew a stark political division by stating that the time had come “…for the Democratic Party to get out of the shadow of state’s rights and walk forthrightly in the bright sunshine of human rights.” The result was a mass walkout by the southern “dixicrat” faction and its long-term political after-effects. This Friday it will be 38 years since one of the most influential leaders of the twentieth century died. He was laid to rest 3 days later on a bitterly cold January day. Hubert Horatio Humphrey started out as the mayor of Minneapolis, elected to that office in 1945. Three years later he was elected to the Senate in 1948 on the wind of his earth-moving speech. Humphrey’s positions earned him some hostility from his party’s more conservative senators, and he came to accept the guidance of fellow senator Lyndon Johnson of Texas. Johnson was not an easy guy to work with, especially after the Johnson-Humphrey presidential ticket was overwhelmingly elected in 1964. As Johnson’s vice-president, Humphrey had the thankless job of selling the unpopular Vietnam War escalation to the American public. Humphrey himself received the 1968 Democratic nomination for president, but would narrowly lose to Richard Nixon in the general election. Humphrey went back to teaching at the University of Minnesota and Macalester College for the next two years. Still restless for the public life, he sought and won election to the Senate in 1970 following the retirement of Senator Eugene McCarthy. But he secretly struggled with bladder cancer for years before he died on January 13, 1978. Humphrey’s public career may have started in Minneapolis, but its formal conclusion was a Saint Paul event. 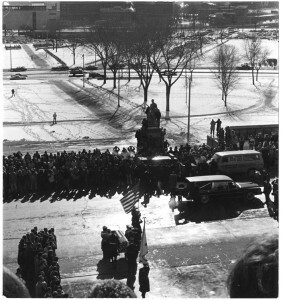 After laying in state in our nation’s capital, his body returned to Minnesota and lay in state at the Minnesota Capitol prior to his funeral at the House of Hope Presbyterian Church. It was attended by 43 members of the Senate, with the eulogy delivered by President Jimmy Carter. (You can listen to this funeral service live.) This day happened to coincide with Minnesota’s cold winter season, and the temperature never got above zero that day. Humphrey’s wife Muriel served the remainder of his senate term, but did not seek another. During the 2012 dedication of his statue on the Minnesota Capitol grounds, Bill Clinton credited Humphrey’s 1948 speech as the catalyst behind the Civil Rights Act, the Voting Rights Act, and the election of Barack Obama.